Back when Monastery Mentor was spoiled, Modern players weren’t sure how the card would affect their format. Or even if the card would affect it. But on February 22, a rising Japanese pro player named Yuuki Ichikawa teamed up with Monastery Mentor to take down a 214 player Modern event. I stumbled across that Esper Midrange Mentor list while doing my metagame spreadsheet updates. It was a cool list (another player at that same event got T8 with it), featuring Lingering Souls, Snapcaster Mage, and a bunch of other Esper staples. You see a lot of decks when you dig through metagame data like I do, but this one looked like it had what it takes to succeed, both in cards and in its finishes. A few weeks ago, I published a metagame update calling attention to the deck. I took note of its MTGO and paper finishes following in the wake of Ichikawa’s win, and I thought the deck’s growth would continue into April. Monastery Mentor didn’t disappoint. The deck is up to about 1% of the paper metagame and at roughly 1.5% of MTGO, which is exactly what the article predicted a few weeks back. This included another respectable 5th place finish at a Modern event in Milan, and, just as this article was being edited, a 15th place finish at the SCG Premier IQ in Richmond. Doubters take note: Monastery Mentor is looking more and more like the real deal. If you don’t know Esper Mentor Midrange, this article will introduce you to its list and strategy. If you do know the deck, it will give you some detailed information on its metagame context and places it can go from here. Despite Modern’s notable format diversity, a lot of players criticize the format as being an inhospitable one for innovation. “Play Goyf or don’t play creatures”; “Abzan is the best midrange deck”; “Just play fast combo and don’t interact at all”. These kinds of statements are everywhere in online and local Modern communities, but Mentor and company are here to prove them wrong. Some cards are instant Modern celebrities, including one of Mentor’s (probable) students: Monastery Swiftspear. MS looked like an auto-include in Burn, exploded onto the scene as an auto-include in Burn, and retains auto-include status to this day. But Mentor was less obvious. Caleb Durward praised the card in Vintage but questioned where it might land in Modern. In two of his articles, one previewing the card itself, Chapin said the card was good but didn’t speak much to its value in Modern specifically. Pro player Adam Yurchick also tinkered with some brews featuring Mentor. Some players noticed Ichikawa’s February finish (Gerry T in an SCG Premium article), but it wasn’t getting as much press as new decks like Grixis Tasigur Twin or Grixis Delver. Although Modern writers might not have caught on to the deck, MTGO grinders definitely took notice. It saw three finishes in the first week after Ichikawa’s victory. By 3/16, the deck was up to 15 finishes since that 2/22 tournament. For reference, this was more finishes than even decks like Jund, Ad Nauseam, and UWR Control had in the period. We are now up to just over 20 finishes in that period, which makes Esper Mentor a solidly tier 2 choice for MTGO. The deck has only 6 paper finishes to complement this (7+ if you add in the recent SCG result from 3/29), but it is only a matter of time before those paper players are ready to enroll under the Mentor. Modern players are no strangers to midrange decks. But playing midrange without the almighty Tarmogoyf can feel as heretical as playing blue in Legacy without Brainstorm. Esper Mentor doesn’t need anything but blue, black, and white, which makes it a standout in a format dominated by green (for Goyf) and red (for Bolt). Below are two Esper Mentor lists for you to look over. I’m kicking off with Ichikawa’s list, the deck that started it all a month ago. Note Chris Mahaffey used a very similar list in his 18 point finish at SCG Richmond. The second list is from JK Eternal’s Modern event, held in Milan on 3/14. Simone Giovannetti has his own take on Ichikawa’s deck, using a tighter but not necessarily “better” list with more playsets. It’s hard to talk about a “core” of a deck that has only been around for about 40 days, especially when that deck is only gradually rising through the ranks. But even at this early stage of Mentor’s Modern career, a few cards are emerging as the core pieces of this deck. I’m not going to break all of them down card-by-card — things like Snapcaster Mage, Path to Exile, and Inquisition of Kozilek/Thoughtseize are pretty self-explanatory. But other cards are either less obvious or just deserve special mention for how they work in this deck and how they make the deck work. Did you think we would start anywhere else? When this deck first hit the online communities, some players speculated as to whether or not Mentor was even needed in the deck. Maybe the deck should just splash for Goyf, or go with a more conventional Delver of Secrets path to victory. But after you’ve played the deck or played against it, it’s pretty clear Mentor really is the engine that makes this deck run, and is just as much a core of the deck as the deck’s name suggests. On his own, Mentor just looks strong. It spits out trainee Swiftspears with every trigger, and swings for respectable damage on his own. He’s at that critical less-than-3 mana cost Modern playability depends on, and has innate resilience to removal in his pump (less relevant) and his ability to create tokens even if killed (much more relevant). That said, a lot of players criticized Mentor as too fragile. He dies to Bolt. He dies to Abrupt Decay. He dies to Path to Exile. He’s not even really a 3 drop, because you probably want to play this with 1+ mana open to get some value out of him if he eats removal. The Esper Midrange shell is designed to mitigate these weaknesses and maximize Mentor’s strengths. IoK/TS can clear the way for Mentor to land on turn 3. You can also play a more controlling game with countermagic and removal until you guarantee open mana to get a Monk; Ichikawa’s list can even ensure value out of the Mentor with Slaughter Pact backup. But you will notice this deck lacks cards like Mana Leak or Apostle’s Blessing, the kind of “hard” protection spells that would save Mentor. Instead, it just drops threats (Mentor included) and pressures the opponent to answer them. If they do, no worries — another threat is on the way. But if they don’t, Mentor quickly takes over the game. Modern isn’t really a format that rewards you for holding back cards to set up a Mentor, but it is definitely a format that rewards an aggressive turn 3 Mentor against an opponent who can’t answer it. Or a Souls into a Mentor with Scour backup; that’s the sort of play Abzan must immediately answer or die. Overall, Mentor fits a unique role of providing both a means of outgrinding an opponent, and also bursting them down when needed. Slotted into this disruptive and controlling shell, it is a formidable card. If you want to play a fair game of Magic in Modern, there are few cards better than Souls. Whether chumping Goyfs and Tas’, protecting your creatures from Lily, or swinging in for 2-4 damage per turn, Souls is game-breaking in many of Modern’s most important matchups. Yeah, it’s not the best card to drop on turn 3 against Burn or Amulet Bloom, but it’s still one of those fair cards that isn’t totally dead in the unfair matchups; even against Infect and Affinity, it clogs up the sky against those problematic Inkmoths and Skirges. The card gets even better with Mentor and in the Mentor shell. Mentor into Souls plus Snare/Scour/Path/IoK backup is just too much value for most decks to handle. As mentioned earlier, it also defends Mentor from Lily in the all-important Abzan matchup. Souls is also excellent with either Scour or Tasigur, giving you more options for getting value out of your milling and over-pressuring an opponent. Modern is reaching a point where virtually all BWx decks are playing Souls (Abzan, Abzan Liege, BW Tokens, Deadguy Ale, 4C Control, 4C Gifts, etc. ), and Mentor Midrange is just the next entry in that lineage. If you played Modern during the Treasure Cruise era of 2014, you will remember Thought Scour. Whether fueling delve in Modern or enabling dredge or Delver strategies in other formats, Scour is a powerful card. Mentor is another deck to abuse it; it fuels your Tas and Cut, you derive value from it with Snapcaster and Souls, and it’s a cheap cantrip to trigger Monk mentoring off your deck’s namesake. Not all blue-based midrange and control decks can use this card effectively. Even the Grixis midrange and control decks using Tas and Snappy don’t go all-in on the Scour playset. But the synergy with Mentor is too much in this deck, particularly because milled cards can be recast to trigger additional tokens. Add the fact that most of your sideboard cards are also flashbackable off SFM and this really solidifies Scour’s place in the deck. Modern creatures are harder and harder to kill. Rhino, Goyf, Tas, Exarch, Spellskite, and a number of other creatures are out of range of Modern’s most iconic removal spell, which has forced an arm’s race of increasingly powerful kill spells. Abzan and Grixis decks have been trying to fit Cut into their shells, but the spell really hasn’t found a home. That is, until now. Esper Mentor has a number of things going for it that make the deck well-suited for Cut. First, the deck packs a ton of low CMC cards and fetchlands, which guarantee some delve fuel. The fetchlands in particular have been a big barrier for Cut’s usefulness in other decks; I tested this in 8Rack but it was hard to reliably cast it on turn 2-3. Second, you really need to run Cut alongside a card like Scour, and as we already discussed, Esper Mentor is great for TS. Between that and the fetches, you have a great chance of casting this on turn 2 as an unconditional Doom Blade. Finally, these 1 mana spells have great synergy with Mentor, because it maximizes your chances of getting Mentor value on turn 4. Even if you just drop Mentor on turn 3 and pray he lives through turn 4, the low-cost Cut ensures you have lots of spells for prowess triggers. Between this and Path, Esper Mentor is unique among midrange decks in having 6 “unconditional” removal spells in game 1 (more if counting Snapcaster recursion). By comparison, Abzan must rely on the highly conditional Decay. Abzan has Treetop Village and Stirring Wildwood. UWR Control has Celestial Colonnade. And Esper Mentor has Tar Pit, an under-appreciated entry in the Worldwake manland cycle. A big part of this was the historic prevalence of Bolt, which dictated a minimum creature toughness for years. But with Jund out in favor of Abzan and Bolt at all-time lows in the top decks of the format, Tar Pit is looking a lot better. It turns out Tar Pit is incredibly unfair against fair decks, particularly BGx ones relying on Decay and Lilly. Pit also dodges sorcery speed sweepers (e.g. Supreme Verdict and Anger of the Gods), as well as sorcery speed spot removal (e.g. Maelstrom Pulse and Flame Slash). This surprising resilience, which is definitely a function of the current decks in the format, makes Pit a great choice in this metagame. 3 power is also considerable, especially when compared with the other burst-damage potential of the Esper Mentor shell. As mentioned earlier, other card choices are pretty automatic for this kind of deck. You can’t play black in Modern without IoK and TS, at least not with a straight face; Tas is a card that could have received some special consideration, but with everyone from Twin to Delver players trying to squeeze the Sultai shaman into their gameplan, he hardly needs introduction these days; Disfigure is a neat inclusion as an additional line of defense against Burn, Infect, and Affinity. As for the sideboard, it’s a who’s-who of potent Esper cards to target important matchups in the metagame: Stony Silence for Affinity, Timely Reinforcements for Burn, Negate as a catchall, etc. 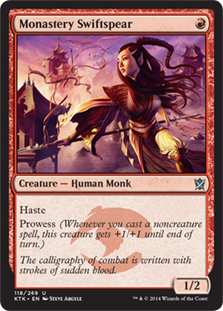 In particular, I’m a big fan of those Disenchants, sideboard cards that have fallen out of favor in recent years but remind me of my earlier days of Magic (GOGO Lin Sivvi, Defiant Hero!). Esper colors give you some strong, albeit largely reactive cards for this current metagame, which further supports the color choices of this deck. Modern has more room for innovation than many players think, and Esper Mentor is both a testament to, and an opportunity for, that innovation. I am sure we will see lots of updates to Ichikawa’s list in the coming months. Here are some ideas about what this innovation might look like, and some directions I don’t think the deck should take. Pat Chapin might have bombed out of PT Fate Reforged with his Esper Delve list, but the Innovator lived up to his name by (re)introducing the Modern world to a hot piece of old tech: Bauble. Chapin used the card to fuel his Tas’s and Gurmag Anglers, fixing draws with fetchlands, and obtaining information from the opponent. Bauble is a natural consideration for Esper Mentor. It not only fuels Tas and Cut, but also dramatically improves your chances of getting some value out of Mentor before he eats removal. Once Mentor resolves, you can simply cast the free Bauble to immediately generate a Monk token. This helps you cast Mentor more aggressively, on top of all the other benefits gained from Bauble. The big issue with Bauble is, of course, it doesn’t really do much on its own. This makes it fairly underwhelming against fast, linear, “unfair” decks in the format that don’t care what information you are gaining and don’t care if your Tas lands on turn 2 or turn 3. But it gets a lot better in the grinder matchups where those kind of plays matter more, where fetchland and quasi-scry synergy becomes more important, and where you aren’t punished for having a “dead” card in a hand. But unlike the upcoming Probe, this is a lifeloss-free way to fuel delve and trigger Mentor, so in aggro heavy environments I would turn to Bauble first. In many respects, Probe can be a better Bauble. It draws you a card right away, and so is never really dead even in fast matchups. It gives you a lot more information than Bauble, which can help you prioritize removal or decide when to play aggressively or reactively. And like Bauble, it fuels delve and has great synergy with Mentor. That said, 2 life is a big deal in Modern. Decks like Burn and Affinity can punish you hard for a free Shock, and the information gained isn’t always worth that loss in life. That’s especially true for a deck already playing a mass of fetchlands and shocklands. Still, I am a big fan of information, especially in a format as diverse as Modern, where decks vary both at the metagame level (i.e. what deck is someone playing?) and the decklist level (i.e. what cards is this version of the deck playing?). This is still very risky against the lifeloss aggro decks like Affinity, Merfolk, and Burn, and in a metagame somewhere around 12% Burn, you really can’t afford that. If your metagame has more Twin and Abzan, along with similar decks, then Probe is a good choice. Otherwise, I would prefer Bauble. Is that Mentor himself?? It’s hard to tell because all Jeskai monks all kind of look alike, but regardless of who the Myth is, this is the natural DTK contender for the deck. I’ve already talked about how I think this is one of DTK’s standout cards, and Mentor definitely figures into that. Played on turn 1, this is an easy 4/4 by turn 4, which is right on curve for a “creature” that basically dodges all removal. It also isn’t as terrible a topdeck in Mentor as in other decks, because it triggers Mentor himself. But it still isn’t the greatest topdeck past turn 2 or so, which creates an odd tension where you want to run more copies to get it in your opening hand, but don’t want to draw this on turn 5. In most decks, this suggests a 1-2 copy inclusion, but I think Mentor wants to go 3-4. You really do want this on turn 1. Keep in mind some of the topdeck drawbacks are mitigated by Mentor himself. 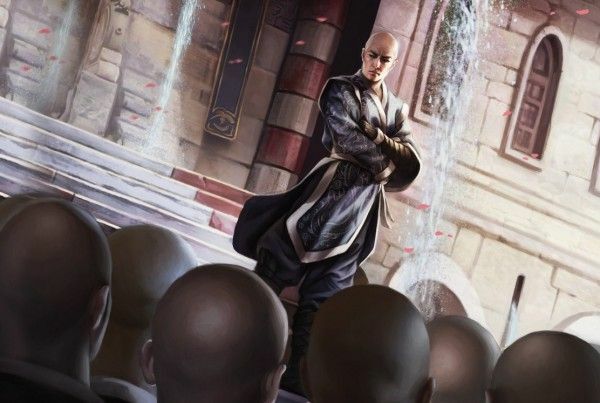 It’s no coincidence Delver is bald. Ex-Jeskai monk anyone? Guess even when you get kicked out of the monastery, you can still have a successful career…as a giant Cronenburg-style manbug. Delver was one of the first cards players wanted to pair with Mentor, and with good reason. Anything flipping Delver is also something triggering Mentor, and prowess is definitely a strong mechanic to pair with the bugman. Delver makes the deck much more aggressive; in the current version of the deck, you are expected to land a creature on turn 3 (with turn 2 Tas a remote possibility). Delver drops on turn 1 and starts swinging on turn 2, a full two turns before your typical 3 drop is likely to get its first crack. That changes both how the deck feels and plays, but also how you should build it. For instance, Bauble would definitely be out, and you would definitely want Visions in (Ichikawa’s build doesn’t use SV). Unfortunately, I am not sure this deck wants that kind of aggression. Delver is so strong in Grixis, Temur, and UR builds because it is backed up by Bolt, Electrolyze, and Snapcaster. This gives you an aggressive reach that is unavailable in Esper. True, we could use Delver to give us additional aggression as a way to increase the deck’s options, but I think this just puts us in a jack-of-all-trades, master-of-none scenario. The final creature I want to think about is Geist. When some players first saw Esper Mentor Midrange, they considered cutting Mentor in favor of Geist himself. After all, Geist had considerable success in Jeskai Delver, UWR Midrange, and Domain Zoo, whereas Mentor was totally unproven. Although I think we have moved past cutting Mentor for Geist, there is still a real question as to whether or not we run the two together. One argument in favor of Geist is he’s much easier to protect than Mentor, and Esper colors are typically good at protecting creatures as is (IoK/TS/Snare, etc.). We could add in Shizo, Death’s Storehouse and/or Eiganjo Castle to support Geist too, and our hard removal spells can clear a path for attacks into even the biggest defenders. A big issue with Geist, however, is our lack of burn spells. Geist is a lot better alongside cards like Electrolyze because you can clear away Spirit tokens and other smaller blockers before an attack. Yes, we do have strong one-for-one removal, but this removal is at its strongest when aimed at Goyf and Rhino, not Pestermite or Spirits. This makes Geist comparatively weaker in our deck than it is in Jeskai ones. Although Geist does give us another beatstick, one that is often a better topdeck than Myth, I don’t think I would run it over the enchantment in the maindeck. I do think it has a home in the sideboard, particularly against removal heavy decks (red ones especially) that threaten early Mentors. Trying 3 of these in the board could be a good direction for the deck to go. If the current metagame data is any indication, Esper Mentor looks like it will quickly rise up to become a Modern mainstay. Expect to see this deck looking even stronger by the time summer rolls around, and even to make some T16 appearances at those upcoming GPs in June. So sleeve up those Esper cards, take down some dailies, and show Abzan they don’t have the midrange monopoly they think they do! EDIT: An earlier version of this article incorrectly referred to the player as “Ichikawa Yuuki” instead of “Yuuki Ichikawa”. This has been amended. Interesting article. I had been trying Monastery Mentor out in a couple of different shells, but he never really stuck. This may be the sort of chassis needed to make the most of him. It’ll rotate from Standard before too long and the price will likely tank. I love rotation for this reason. Great write up on an interesting new deck. One thing I would like to point out though is that Yuuki is his given name and Ichikawa is his family name. In Japanese, you say a person’s family name first. Just a minor style note. Good catch there. I was trying to stick with the last name for the rest of the article, but missed it when I typed out his whole name. Will edit the article and put in a note; thanks! I would have loved a section on ways to combat the deck. Great write up though! I saw the esper mentor deck and have been tinkering with chapin’s esper delve (gurmag angler) deck. There is a tonne of overlap here and I’ve been trying to squeeze mentor into the angler list with minimal modification – he can be pretty slick with probe/bauble as you say – and the rest of the delve deck is very similar. Why tar pits over colonnades? Or at least a mix of the two? Bolt might be lower on the radar but it certainly still exists! Good idea. I’ll probably do a followup or check-in article on the deck in the next months. At that time, I’ll add in some ideas on beating the deck. A lot of the anti-Abzan strategies will apply here. Esper Mentor is good at answering threats one-for-one, but can’t deal with redundant threats and/or massed threats. The issue with CC seems to be manacost. The deck only runs 22 lands and it’s hard to support reliably CC activations with that. You would really want 24-25 lands for that. With Tar Pit, the deck can do everything with just 4 mana (including Tas activations). But with CC, you need 6 lands in play. makes sense I guess. I know for the original delve/angler list there are no ETB tapped lands, as its too important to have untapped lands if you want the turn 2 tas/angler with stubborn denial protection up (and just generally you’re not looking to go past 4 lands nor tap out on your turn). I’m kind of surprised to not see Darkblast as a 1-of in this archetype. It is recurrable, instant, fuels delve, souls and snapcaster, turns bad trades into decent/good ones as well as nearly single-handedly nullifying affinity and infect. I may be a bit biased due to its use in my Dredgevine list, but I have very few bad times when I see this card.